Also, here are more images from the same stamp set... such an awesome collection!!!! This masculine "I Saw it was your Birthday!" card was made with the new CDS stamp set called "Tool Time" and the Background stamp called "Heavy Metal". For the look, I used a real metal nut, silver TOOL brad charms, silver brads, a silver metal word plate and silver embossing BG with multi layered ribbons. Here is a sweet babygirl card made with the wonderful BABY/Expecting themed set to be released September 1st at CDS called "Miracle From Above". 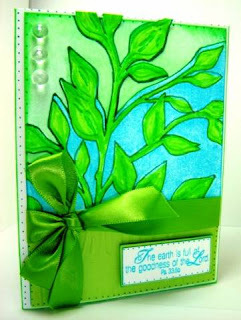 This beautiful sentiment is part of a new set at CDS called ""Pretty Little Scriptures", ALSO releasing Sept 1st. Here's another CDS Sneak Peek for September's releases. This is from a new scripture set called "For Our Lord". Don't you just the Chevy? Great card and just have to say that I love all you House Mouse cards too! Very cool!!! I love how you did the dp! Cool red, white and blue classic cars cards! I also like how you did the DP on this! oooh ~ love it! I'm going to have to get this set, my Mom had that same car in the same color! Wow, a lot of great looking stuff! There is such a need for masculine sets and these look great! Ooh - these are fantastic! I am off to look! Wow, America!! All your cards are gorgeous! You make such pertty cards!! The Clear Dollar Stamps have such great images and you do wonders with them!! Keep up the great work and keep blogging!!! What a group of really creative cards! They are all so pretty and unique. These are all so cool & so nice design,I really impress of ur great work....Please keep it up good quality work.